Visual spectacle is a wonderful thing. Creating a new world right before our very eyes? At its best, it can literally take you away. When that happens, it’s a transformative cinematic experience. When that doesn’t happen, however, it’s a completely hollow one. 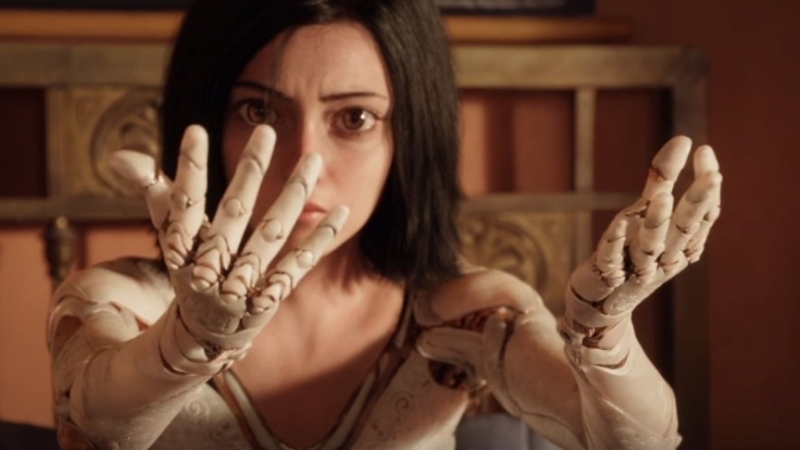 Such is the case with Alita: Battle Angel, which looks great but never quite engages you in its story. Hitting theaters this week, it’s a massively budgeted would be franchise starter. Some of the ingredients are there, but the soup just doesn’t taste right. Though hardly the disaster some were speculating it could have been, this is still a mostly unsatisfying experience. The film is a science fiction epic, based on the graphic novel series Gunnm by Yukito Kishiro. Set in the future, it’s a tale of a female cyborg (Rosa Salazar), once left for deactivation, who is revived by Dr. Dyson Ido (Christoph Waltz). Unable to remember her past or why she was deactivated, Dyson gives her the name Alita. Curious about the world, Alita begins exploring, but her presence catches the eye of Chiren (Jennifer Connelly) and Vector (Mahershala Ali), who have use for her in a very specific way. You see, her past is a more violent one than she could ever imagine. Thus begins an adventure where Alita will slowly come into her own. Robert Rodriguez directs and co-writes the adaptation with James Cameron and Laeta Kalogridis. Supporting players include Jai Courtney, Jeff Fahey, Eiza González, Jackie Earle Haley, Keean Johnson, Ed Skrein, Casper Van Dien, and a high profile cameo I’ll let remain a secret. Bill Pope handles the cinematography, while the score is by Junkie XL. Kudos to everyone who came up with the look of Alita: Battle Angel. Everything visual here is a treat. That’s about the only thing to praise. Everything else is mediocre or worse. Plus, it ends right as you’re starting to get invested. The story? It’s old hat and not especially engaging (plus something else I’ll address in the next paragraph). The acting? Meh. You’re left with just special effects to admire. They’re stunning, to be sure, but you need more than that to hold on to. Plus, and this is more my issue than a huge problem for everyone, there’s a highly unnecessary dog death at one point. It was off-putting and incredibly pointless to the plot. One of the most egregious errors made here by Alita: Battle Angel is, as mentioned above, that it ends just as the plot is getting interesting. Intended to start off a franchise, it presumes a future that it won’t likely ever get to have. Cameron obviously had a whole series in mind when he first decided to undertake the project. That didn’t change when he handed off the reins to Rodriguez. It’s just never going to happen. It’s a shame too, as what comes next is actually intriguing. I’d rather have seen that incorporated into this film, obviously, but now it’s likely never to be resolved. Alas. This week, audiences looking for the next great sci-fi tale may opt to give Alita: Battle Angel a shot. Be forewarned, while there are highs, the lows are much more consistent. That, along with the incomplete story, is likely to make it as much of a frustrating experience as anything else for potential viewers. Cameron fans likely will want to finally get a look at this, and it’s hard to blame them. After all, it looks great. The key word there is looks. That’s all this has going for it. Do as you see fit, but just know that it wasn’t quite up to par for yours truly. Alita: Battle Angel, hits theaters this weekend!